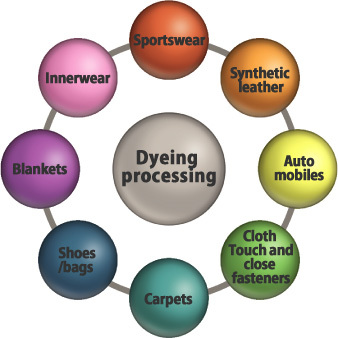 “Textiles” processed by us become various things, such as clothes or materials, depending on how they are treated. we have especially worked hard to accomplish utmost functionability and comfort to meet various needs, providing mainly stretch fabric for clothes, synthetic leather and industrial materials. The 12 raising machines we own are all of different models, enabling us to handle every raised material from suede to BELL-TOUCH (cloth Touch and close fasteners). Also, the resin finishing machines are 3.6 meters wide, and are also capable of water repelling, water absorbing, flame resisting, antibacterial and other finishes. Textile products seeing fierce international competition these days, with increased import every year and appreciating yen and increasing cost making export difficult, and domestic business is dwindling.However, there is room for expansion for textiles used for purposes other than clothing (for materials); our company has always set as our main business the field of materials, and we strive to develop products that will push up above the rest in the global competition and to create a bright future for our company. fish to grow, returns to Lake Biwa. To create beautiful colors, we need clean water. The site of our company is located next to LakeBiwa, the largest lake in Japan, and this region is known for its abundance of clean water and for its dyeing industry. Even though our technology is advancing, we still feel that in order to continue to create beautiful colors, it is essential to protect the quality of water and live in harmony with the environment. 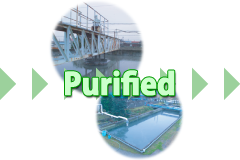 We have built a water treatment plant taking up 5,000 m2, 25% of our entire premises, and treat 1,000 tons of water every day.As you can see on the left picture, the water is dirtied with the process of dyeing, but after a complex purification cycle incorporating a higher dimensional blending of biological and chemical treatments, the water is cleaned to the point that goldfish and carps can happily swim in.We return the 1,000 tons of cleaned water to LakeBiwa, along with our feelings of appreciation and thanks. In the next column, we will talk about integrated manufacturing.